Boston Police report arresting Edward Tarencz, 30, on a charge of unarmed bank robbery for an incident yesterday at the TD Bank branch at 24 Winter St. Read more. Boston Police report arresting a Hyannis man after, they say, he robbed the TD Bank branch at 24 Winter St. in Downtown Crossing yesterday evening - and then stuck around the area. Read more. The FBI's Bank Robbery Task Force reports it's looking for a guy who walked into the TD Bank branch at 24 Winter St. late Thursday afternoon and told a teller he needed money and he needed it fast. He's described as being medium height, with a medium build. Orange Line service was briefly held when police searched the Downtown Crossing station for him. The FBI's Bank Robbery Task Force reports it's looking for two guys who held up the TD Bank branch at 533 Boylston St. on Monday. Read more. Needham Police report the TD Bank branch at 89 Highland Ave. was held up around 4:15 p.m. yesterday by a guy who actually put a mask on. Recent years have seen a decline in the number of bank robbers who bother to disguise their faces. The TD Bank branch at 1270 Mass. Ave. (corner of Plympton) was held up around 10 a.m. by a black male in his late 20s, wearing a Redskins cap and a white-collared shirt. He fled down Plympton. Not long after, police halted a Red Line train at Central to search for him. 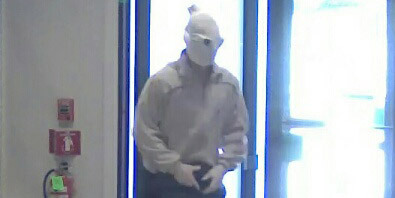 The FBI reports the TD Bank branch at 535 Boylston St. was held up Sunday afternoon by a man who gave a teller a note. He's described as black, about 6 feet tall, mid 40s and heavy, and was wearing a brown knit hat with a stripe, white button down shirt with a white tank top underneath, dark colored pants and black sneakers. The FBI is also looking for a white guy who pulled the same basic maneuver at the bank on Nov. 17. He's described as 5'8" or 5'9" with a medium build and in his 20s. The branch was also held up on Aug. 4.